- Lenin, Stalin, Putin... Holden? Who would've thunk it when Ronald Reagan labeled the USSR the "Evil Empire" back in the '80s: Russia wins the Eurobasket led by an American coach, on a last-second shot by a guy from Pittsburgh, J.R. Holden (see above). - Holden did not really have the greatest game today, forcing up some rushed shots thru-out the game, but he came up huge in the last :30 secs. Made a great read to double down on Pau and stripped him on the post with :25 secs. Then after a possession where Russia had trouble getting organized, Holden took it upon himself to create an opportunity with the shot clock winding down. He drove to his right, pump-faked Calderon off his feet, and stepped thru into a mid-range jumper that bounced high off the rim, a la Allan Houston, then found its way thru the net, giving Russia a 60-59 lead with :02 secs. Then Spain got one last chance to win, and Gasol got off a jumper that just rimmed out, and the upset was complete. - Stunning upset that Russia could knock off such a superior talented team at home. I have to imagine Pau & Spain will have a mighty hard time getting over this one. This thing was set up perfectly for them: the best team in the tourney, fully stocked with their best possible players, playing at home, & not having to play arguably the 2nd best team in Lithuania. - It was a strange game, in that Spain seemed to be in command for most of it, and one really wondered how Russia was staying in the game because they were having so much trouble generating offense. But they fought back from a 12-point deficit in the 2nd quarter to trail just 34-31 at the half. Then, the Russians appeared to be in huge trouble when AK picked up his 4th foul (players foul out with 5 in FIBA) with 2:32 left in the 3rd Q, trailing 49-41. But they fought back and actually made up ground, down just 52-51 when Kirilenko returned with 7:42 in the 4th. Still, it looked like it was over when Gasol put Spain up 59-54 with 1:48 left, but the Russkies kept coming--before Holden hit his game-winner with :02 left, Russia led for just 1:00 total in the entire game. - The big reason that Spain lost was that they had a terrible time converting good opportunities--they were a dreadful 7/35 (20%) on 2-pt. FGs on the night and made just 15/26 FT (58%). After such a tremendous Eurobasket for two weeks, Pau Gasol had a nightmare of a final--he just couldn't connect on his interior shots. Some of that has to be credited to the Russian defense, but Pau just could not get shots to fall. Then he had a 4th quarter he would soon like to have wiped from the records. Pau was 3/8 on FTs and combined that with 3 TOs, including the costly TO with :25 left. All these miscues would have been forgotten if Pau could have knocked down a desperation jumper with :02 left, but his shot just rimmed out. Overall on the night, the Spanish go-to guy was just 4/13 from the floor and 5/12 at the line (14 pts, 14 reb, 3 ast, 3 blk, 5 TO). - The Russian defense was stout as usual, especially in the interior, and shut down Spain's vaunted attack of multiple weapons. 2nd game where they did great job defending in the interior and did not allow Spain to get clean looks inside of 12 feet. Russia actually held their opponents to 41.3% on 2pt attempts for the tourney, held Spain to 10 pts in the 4th quarter & forced 6 Spanish TOs in the 4th. Russia led the tourney in steals (8.4 per) and forced 15.8 TOpg--Spain had 15 TOs. And they gave Spain a dose of their own medicine by constantly switching up their defensive looks, and mixing some more weird hybrid alignments that Blatt used successfully all tourney. - Kirilenko pretty much got his offense either by dunks or free throws. But his biggest play came, as you might expect, at the defensive end, where he made a big steal with a minute remaining which led to Morganuv cutting the game to 59-58. AK47 was a force inside and out on defense as usual and was deservedly named the tournament MVP. He had 17 points, 5 rebs, a block and a steal in the final. - Not sure the public realizes what a great tourney Vik Khryapa of the Bulls had. He was basically a poor man's AK47, doing a little bit of everything, and teamed with Andrei to form a potent defensive duo. What was great about Khryapa was his great versatility on defense--Blatt had him inside & out, freelancing like AK47. His passing is underrated as well--he moved the ball great all tourney long, and he is an adept passer off the move as well. He crashed the glass every game, and today was no different, 12 rebs to go with 4 assts & 3 stls. - Big man Alexei Savrasenko did a nice job slipping free in the paint for some easy looks (10 pts). But maybe more important was his interior defensive presence, and his individual defense on Pau was commendable. - One positive that Spain (and the Raptors) can take away from Euro '07 is that Jose Calderon might have solved his main weakness: outside shooting. Calderon has been stroking the longball great (50% for the tourney) and he was once again sharp from the perimeter, scoring all of his 15 pts off of 3pts (5/7). Curiously, Caledron was on the bench from about 6:30 to the 3:00 mark in the fourth quarter, even though he only had 3 fouls. - Despite the great point-guard play, Spain could not get the kind of production they expected & needed from their 2 talented shooting guards. After a 23-point outing vs. Greece, Navarro was nowhere to be found, forcing some looks to end with 0 pts on 0/5 from the field. Meanwhile, Rudy Fernandez contributed just 5 points. - Can't say enough about the job Russian coach David Blatt did in Spain the last two weeks. Knew he was one of the finest coaches in Europe and he would help Team Russia overachieve & finds ways to mask their lack of offensive firepower. But I figured just getting into the quarters would be about Russia's ceiling, maybe the semis at best, but that's it. Blatt's name has been bandied about before in reference to a NBA gig, at least at the assistant level to begin. And I'm sure some NBA clubs' interest might be piqued after this Eurobasket. I know my partner probably would not mind at all if the Celtics "forgot" Doc Rivers at the airport one road trip, and replaced him with Blatt. - This game should be a reminder to Americans who have already gotten way ahead of themselves in comparing the current Team USA to the Dream Team: medal rounds of FIBA competitions are NCAA Tournament-style one-and-done knockouts. Spain is a better team than Russia, hands down, but on this day, the Russians fought like hell and the bounces went their way, and now they are the champions of Europe. Anything can happen in a single game of basketball. I just wanted to thank you guys for the absolutely tremendous work you did throughout this tournament. Indispensable coverage. Excellent work covering the tournament. It's true that anything can happen in one basketball game. I'm not sure there is anything the U.S. can do about that though. They are easily the top team, and would always win a 7-game series, but the nature of international tournaments means they'll have to be perfect. Thanks for the comments. We try to do as comprehensive coverage of FIBA play as possible. And covering the Eurobasket was easy & more enjoyable for us compared to trying to stay interested in the Americas tourney. Not only is the level of competition better, but the Eurobasket is much more than just a qualifying tourney. Great work, guys. Loved catching up and watching the clips of all of Greece's comebacks. For what it's worth, Nash's inclusion really depends on how well the Suns do in 07-08, so he is mum on participating until then. ...Or will the 4 Euro teams simply destroy the rest of the world regardless (Brazil wasn't that great in the Americas, but maybe Sideshow Bob would have helped them). I really enjoyed reading your description about the tournament because you told the true stories (eg, Vik khyrapa played great the whole tourney), whereas some sportswriters are more interested in hyping so-call superstars. Vik Khyrapa is a talented and very versatile player, but he cannot even get much playing time ahead of a undersized/no-defense/one-dimentional player on Bulls roster, because Skiles is a stupid coach. The Bulls should hire David Blatt before anyone does. By the way, thanks to Harry Abbott for the link. I likes Harry's TrueHoop a lot because he has good taste (I've not registered on ESPN). I think JR Holden is paid hefty to play for Russia. He made the bigest plays - point added game winning plays (a steal and a shot) - and yet had or showed no emotions. Russians are making piles on each other when the game ends, and JR is quietly walking back to the bench. Wow what it would be like when he will face his native country next summer. I could see a lot of smack being trown at him by Americans. Great coverage on the Eurobasket. Thank you so much and keep up the good work. As for me, this was my first Euro as for it was a surprise to watch the games LIVE here in Malaysia. But it was pity they did not show the FIBA Americas, which matters to me of course. Excellent stuff from these great Europeans. It's good to see more of them in the NBA as they bring a different dimension on the court. - Great game. After the first minutes I thought this would become a blowout, but somehow Russia managed to hang in there. - JR Holden reactions are a sight to behold. He didn't seem to participate in the celebrations at all--just a friendly exchange with the coach. I figure it's his personality; he didn't show much reaction after his last shoot either. 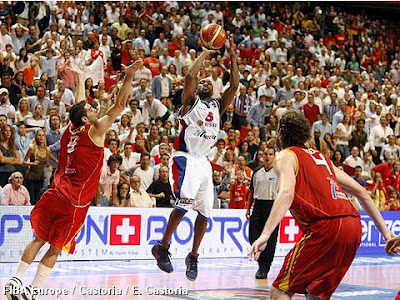 - Why is it so surprising that Calderón can shoot? I thought he was their most consistent shooter in the playoff series against NJ. - Toronto has two of the best four young playmakers in the league. I wonder if they are already considering a trade or if they want to wait for a better opportunity. Because both TJ Ford and Calderón are too good for riding the bench, and there are plenty of teams in need of a point guard. - Olympic qualifier: You have to consider Greece a lock. Slovenia looked great here, save for their lapses in the final minutes, so if they play near that level, they will be there too. The final spot is pretty much up for grabs, Germany, Croatia, PR, Brazil and Canada (with Nash) all have chances, depending on who gets hot for the tourney (Nowitzki, Arroyo, etc.). Not sure, how the former MVP would work out against a euro zone and if Canada has the shooters to surround him, but you can always win with the best player in the game. - Many thanks for all the coverage and commentary! JJDyno, think Canada does have an outside chance for one of three spots, even without Steve Nash. The pre-Olympic tourney looks likes it will be 7 teams fighting for 3 spots (Gre, Slov, Croat, Germ, Braz, Can, & PR). Feel pretty confident Greece will lock up a spot (assuming most of their big guns are there) after that not sure who I pick for the last 2 spots. Leaning toward Slovenia right now for another spot considering how well they played this year combined with the fact they could add guys like Nachbar, Brezec, Udrih or Becirovic next summer. But the last spot I have no idea. Would have to put Croatia, Germ, & Brazil on the same level, and Can & PR just a notch below. Looking at Team Canada, think they are a soild defensive unit--Dalembert was a key addition. Like their frontcourt rotation, and good on the boards. But this team is lacking offensive firepower, they really have no go-to scorer. Thought English could be that guy, but he really did not impress this summer, and basically is just not good enough to be a main option. Famutimi has got potential to be a nice player, but he seems to disappear for stretches. Also, the lack of a true point guard is an issue, a solid PG could help liven up a weak offense. If Nash shows up next summer (which I highly doubt considering the tourney is an early July), it definitely helps, but not sure it secures a spot. Hello everyone from Serbia. Great work you did here, enjoyed reading another opinion. Just two things i wanted to add - Holden has that kind of personality, he never shows much emotion, and he is silent type. He also very, very rarely (almost never) talks to the press. And second, remember that Slovenia is one of the surprises of this tournament. Not when reading names, but it's one of those teams like Turkey, Serbia or pre-2003 France, that has problems inside the team that has little to do with single quality of players. 0820jejeL'offre est asics running homme blanc généralement assez limitée avec quelques fournisseurs présélectionnés par l'entreprise achat nike air max 95 pour fournir le produit. Il a chaussures nike roshe run noir anthracite rouge causé un coup avec des célébrités alors basket adidas superstar femme rose que dans la musique hip-hop Asics Homme à l'intérieur du Royaume-Uni. Cette saison de la air jordan 3 retro homme pas cher NBA, Rondo portait une couleur Celtics asics gel femme blanche Hyperenforcer qui a un numéro de la asics gel lyte 5 langue.